Pebre—The Chilean condiment everyone should know about. Pebre, a ubiquitous Chilean condiment that can be found accompanying a wide variety of meals throughout the country, in restaurants and homes alike, was a revelation to me. It was love at first bite. 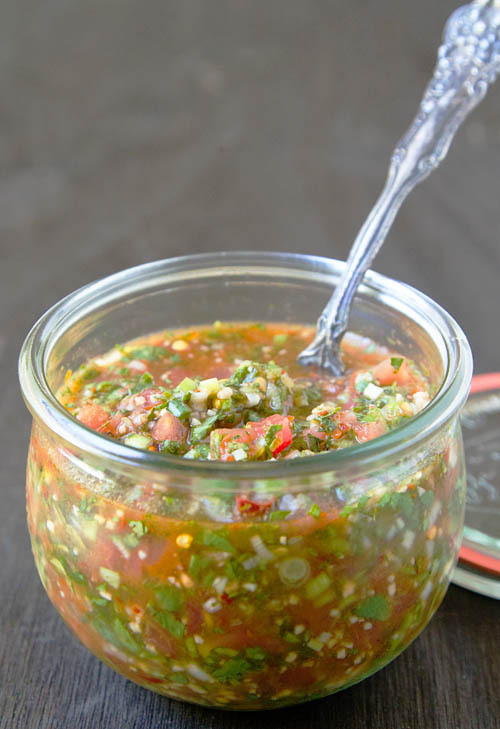 The sauce varies depending on the region of Chile and the household in which it’s made in, but the basic building blocks are cilantro, garlic, onion, olive oil, and ground aji chili peppers. If Mexican pico de gallo and Argentinian chimichurri had a baby, it might look something like pebre. When I was cooking with Ms. M, she explained that pebre is something you always have on hand because in Chile they put it on top of everything, from boiled potatoes to empanadas, from stirring it into soup or spooning it over meat. As she chopped ingredients, Ms. M told me stories of the giant jars of pebre her grandmother would make and keep in the refrigerator, constantly having to replenish what she had made because everyone ate so much of it. Making the sauce is easy. 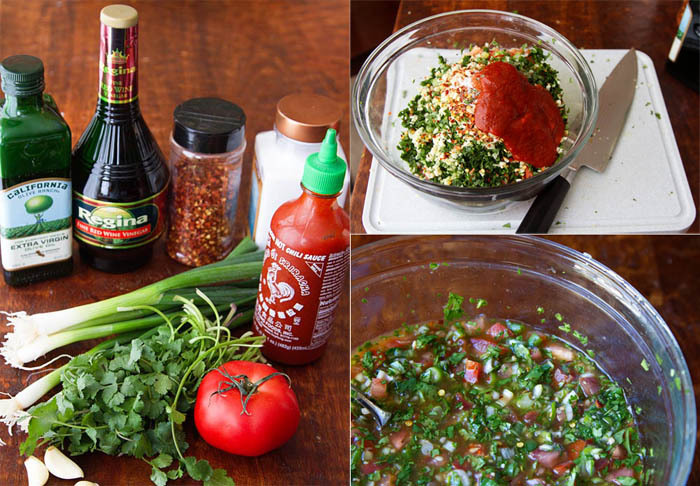 All you have to do is chop up all of your ingredients into little bits, then mix in a few other ingredients like crushed red chili pepper flakes, olive oil, spicy red chili sauce (Ms. M says sriracha makes a perfect substitution for the Chilean ingredient, Aji Chileno, that she would use in Chile! ), and red wine vinegar. Ms. M’s mom suggests using the Regina red wine vinegar, as it tastes most like the kind she would by in Chile. 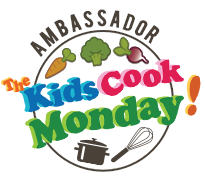 Once all of that is mixed up, then you add enough cold water to just barely cover the ingredients in your bowl, stir everything again, then cover it and put it in the refrigerator for a bit to let the flavors meld and develop. The result is a spicy, tangy, herbaceous sauce that will have your taste buds popping. I dare you not to love it. *Notes: This is the way Ms. M’s grandmother taught her to make pebre. Ms. M is from Santiago, so her pebre may look very different from a pebre made in someone’s home in another part of the country. That’s the beauty of this condiment! Some versions use tomatoes, others don’t. Some use onion, and others, like Ms. M’s family recipe, use scallions. Some use chopped chilis, and others use a chili paste! The sky is the limit. If you don’t like something, change it up and make you’re own version of pebre! 1. Mix everything, except the water, together in a medium sized bowl. 2. Add enough cold water to barely cover the contents of bowl. 3. Mix everything together, cover, and place in the refrigerator for a few hours to let all of the flavors blend. Best eaten the day it is made. Holy crap, I need to make that right now. Best reaction ever! LOL Hope you adore it as much as I do! Thanks Lucia. Actually, this isn’t my recipe. As I mention in my post, it’s my friend’s recipe. She is from Santiago, and this is the way her grandmother taught her to make pebre. Her family ate it on a regular basis, and the list of foods I mentioned were things she told me about. 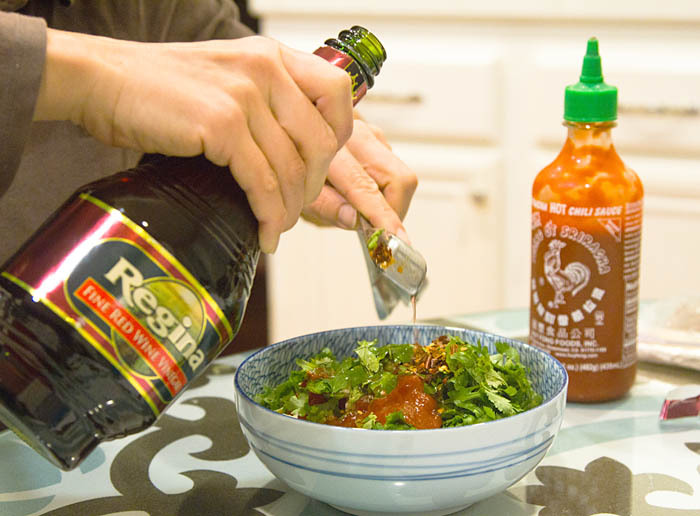 As far as the sriracha goes, this is what she uses now that she lives here in the US as a substitute for aji chileno. From what I’ve read, there are many versions of pebre! My friend will laugh when I tell her someone said her pebre is gourmet. Lucia , you are absolute wrong. I am Chilean, and I have preparing pebre for many years. Eaten pebre on top of “sopaipillas” is something that started some 20 years ago. You can use pebre as a dip, you can added to meets, rice, etc….It seems that you never have tried pebre beside sopaipillas and choripanes….Even with hamburgers is good. I think some of you Chileans are missing the point , that this is a recipe created to taste like Chilean Pebre, it is not the way we make it in Chile. Of course no one uses sriracha chili sauce in Chile we use Aji Chileno. NO other fresh pepper I have ever tried in the USA is close in taste, but the Siiracha sauce does definitely come close. :D I do have to laugh because Pebre is different everywhere in Chile and Tomatoes are most definitely not always in Pebre. In my family Pebre is green and there are NO tomatoes used ever.But everywhere you go Pebre is different. Thank you so much for your comment Helencita! You said perfectly what I was trying to have come across. Your green pebre sounds DELICIOUS! Interesting debate. 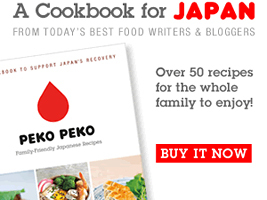 I am going to try Fujimama’s recipe, but I would also like to try yours, if you feel like sharing it Helencita. I saw pebre being made by our Airbnb hostess this past New Year’s Eve. She used tomatoes and the concoction looked luscious, but I don’t eat raw tomatoes so I didn’t request the recipe. Others in my family do eat tomatoes raw, so I’ll try this out on them (along with pastel de choclo). Patricio, I’m chilean too. Pebre and sopapillas have co existed ever since they have both been around, I remember the Chilean winter street food in the 60s and 70s there would be always an abuelita cooking sopaipilla and fried fish with pebre on top, yum! My family has always made pebre without the tomatoe, we made it with spring onions or red Spanish onion, garlic, coriander, olive oil, salt, red wine vinegar or apple cider vinegar, srirach or Tabasco or chopped red or green chilies, what ever chili you want to use and my mum would always dissolve the salt in warm water from the kettle the pour it over the It’s yum! Whoa! This looks amazing. Right up my alley for sure. I’m going to give it a try! I can totally see why people would want this on top of everything! Im making this one! Yum!! I can hardly wait until my tomatoes ripen so I can try this! I’m warning you now Kenny, you’re going to become a pebre addict! Love the story behind! I’m Chilean and yes, we love our pebre. It’s beautiful on your bbq meats as well, I love cutting everything really chunky and using it as a side salad. wow, I am a transplanted Chilena and I miss pebre so much. The Siracha Chile was perfect as a substitute and tastes very much like the Aji Chileno we get there. I tried this recipe and it is delicious , I added some finely chopped red peppers because with the tomato and the Siracha it all looked a little brown. I will agree with you that every family,and every restaurant in Chile have their own version, sometimes very red , sometimes with tomatoes and sometimes all green, mild or fiery. LOVE that you’ve found a way to adapt this recipe to things we can find in the states! Oh how I’ve missed that flavor :) Any suggestions for a Chrizo substitute? Chilean chrizo is NOT the same as Mexican chrizo which is all we can find here. I miss my greasy chroipan! Hi Tammy, unfortunately I don’t have any suggestions! I’ve never had Chilean chorizo, though now you’ve got me dying to try some! I am chilean. We don’t use scalion. We use onion, tomato, cilantro, green peper- banana pepper- little oregano, olive oil, salt, black pepper, garlic. wine, this is the ultimate combination…..
Hi Patricio, this recipe is actually my friend’s recipe. She is from Santiago and this is the way her family made it in Chile. I find it fascinating how this particular condiment differs depending on where you are in Chile and what family is making it! Hey there, yes i’m another Chilean but i’m not here to argue. There are tons of pebre’s recipes, your friend’s is another one, i think i agree with eating pebre with almost everything. I must say that i don’t eat it on my daily basis but every time i go out and have the chance to taste it with some bread, meat, salad, sopaipillas or something else. I came here looking for a pebre recipe at pinterest and they led me to your blog, i must say that this is really nice and your pictures are fantastic!. I made this tonight for a salsa competition and I won first place! Great recipe, unique and everyone liked it so much there wasn’t any left over! Thanks for sharing the recipe!!! Meg you totally made my day! Congrats on the win! I’ll have to let my friend know that her family’s recipe won you a first place, she’ll be tickled! I’m chilean and I love pebre! 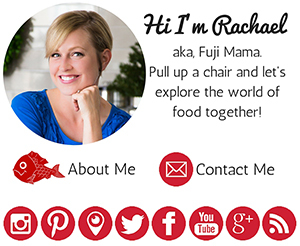 You’re totally right when you say the recipe slightly varies from family to family but the base pretty much is the same, sometimes I add green onion and/or radish to my recipe, give it a try! I am Chilean, and what I know about pebre is that it does not have tomatoes in it, if you add tomatoes its called chancho en piedras. But its great either way ? Hi Ruth, This recipe is from a 90-year-old Chilean grandma from Santiago! I must have this in my life..This will be made soon..I may have to add some fresh roasted green chili to it..Thanks for the share! I am Chilean also and, although I am delighted to see the popularity of pebre rise in the world, many conservative cooks would stone the recipe maker for adding water. It tones down the flavors of the sauce, making it bland. Most of the time, it’s just enough to have the tomato juices do their job, and if it’s not enough, there is also vinegar. And something extra would be some lemon or key lime juice, although the latter would make it more like Mexican pico de gallo. And if you ask me, yes, there are many varieties of this recipe, but from what I’ve eaten in lots of houses and restaurants (And I really mean lots of them), water is a sin. And if I have a personal variety, yes, it features purple onions and Peruvian chili pepper (Rocoto), as it’s more common in the north of Chile, where I live. This is twice as good as pico de gallo! Thanks so much for the recipes. I agree! 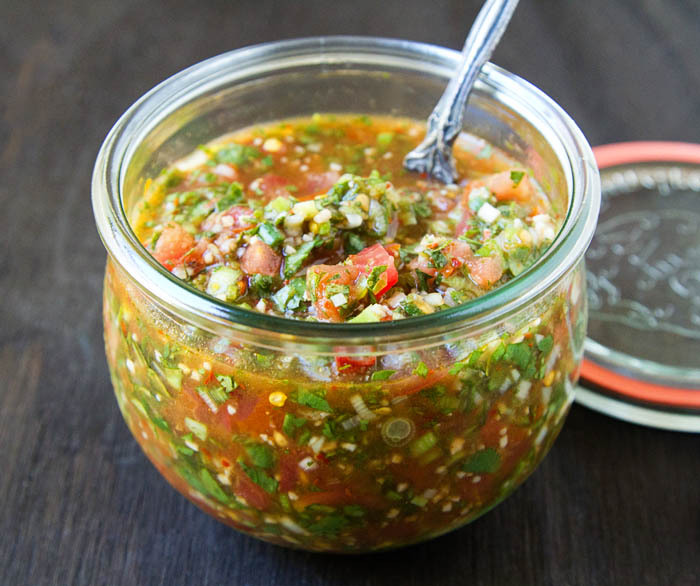 So much flavor and I find that I like it on a wider variety of foods than pico de gallo. I’ll have to try this recipe out. My mom is Chilean and her cousin Claudio (a professional chef that owns restaurants in Santiago and Vina del Mar) makes THE BEST pebre (a few differences from your version are his use of safflower oil, shallots, and WHITE wine vinegar). I’ve made it several ways and have never been able to replicate his delicious version. I’d like to try this as a comparison. This sounds amazing and I’m making this tomorrow. This was terrible proportions. Not at all enough tomatoes, way too much garlic, Chileans use regular onions not scallions. I made this for my in laws from Chile and we had to heavily modify it in order to make it right. Also sirachaand pepper flakes, Wtf? It is supposed to be fresh chilies. Well I’ll have to try this. I live in Colombia (where we DO get siracha sauce 😁) and we have our own salsas too. What I wish is that some enterprising person would import/export ALL the Chile’s/ajíes that are grown in S. And Central America so that no matter which part we live in we can buy all the varieties and make the dishes. The Peruvian cuisine for example is marvelous and it relies heavily on its diverse ajíes. Where are the peppers in the recipe? I see only pepper flakes. Am I nuts? I found this a month ago and have made it almost every week since. This is an amazing, herbacious explosion of flavor and I am in love! I’m going to use this for a condiment at a carving station this weekend for culinary school. Thank you for posting! I think it is absolutely delicious! I am eating it with just chips but I am going to make it a baked chicken topping one day. I love it. I’m so glad! We put it on all sorts of things too!